This is my largest palmistry book. Based primarily on The Palmistry Workbook, the text has been expanded and revised. Written for a mass market audience, this small-format (4-3/16" x 5 1/2") book contains 512 pages and over 400 handprints and other illustrations. It's packed with practical guidance about how to read hands, and includes detailed sections on Indian (Hindu) palmistry and Chinese palmistry never before presented in a single volume. The Little Giant Enclopedia of Palmistry. Sterling Publishing, Inc., 1999, 2007. Paper, 512 pages. $9.95. ISBN: 0-8069-6161-9. 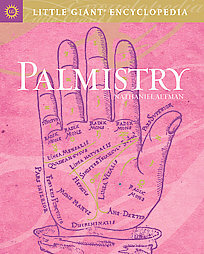 To order The Little Giant Encyclopedia of Palmistry, click here. To return to the Books page, click the image.